Froot Loops Cake? Rice Krispies-bread House? Festive Frosted (Snow)Flakes? 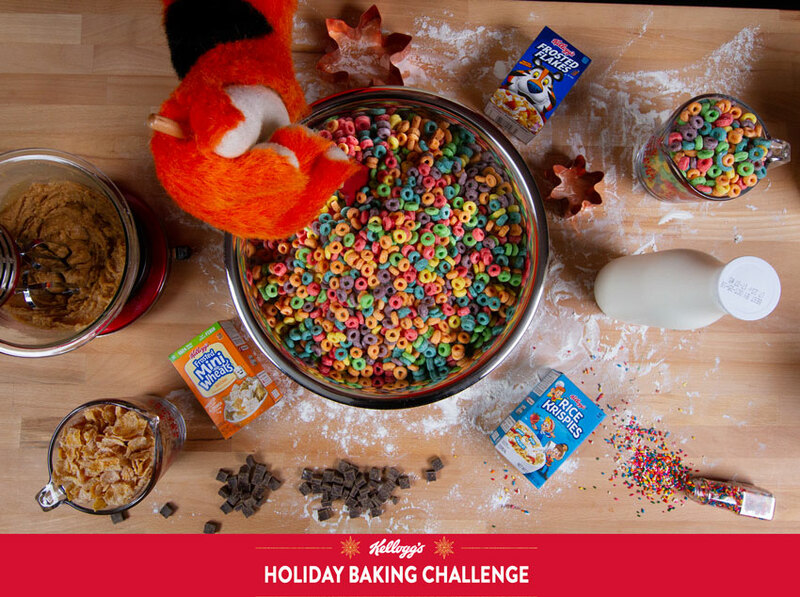 This holiday season, cereal is the star of Kellogg’s first-ever Holiday Baking Challenge judged by cookbook author and TV host, Padma Lakshmi! Anyone across the U.S. is invited to submit recipes of their best confections to the inaugural Holiday Baking Challenge at www.kelloggsnyc.com/holiday for the chance to show Kellogg’s and Padma Lakshmi their baking chops in New York City. Four finalists will take participate in the live baking competition on December 12th at cereal wonderland, Kellogg’s NYC Café, where they will use their culinary ingenuity to reimagine favorite Kellogg’s cereals into inventive new holiday goodies. Lakshmi will be there in person to both host and judge the event – crowning one winner as this year’s cereal-themed “must-make” holiday dessert. In addition to bragging rights, the lucky grand prize winner will have their dessert featured on the Kellogg’s NYC Café menu, plus a full media tour with Padma herself. With the competition taking place in a venue made for breakfast lovers and foodies alike, we can’t wait to see how an unexpected ingredient like cereal is used to make new, playful desserts. Do you think you have what it takes to become a Kellogg’s baking champion? If so, grab your favorite cereal and get baking! Created in partnership with Kellogg's.